OWH Stars and Stamps (Our OLD blog! ): OWHtv: Episode 41...easiest Stump Sandy EVAH! Watched here on the OWH site because this wasn't viewable on YouTube yet. I LOVE your weekly episodes, Sandy & look forward to them every week. 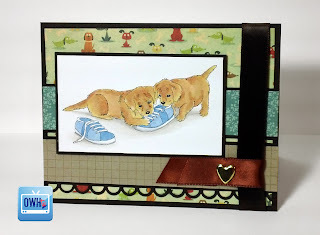 The stump Sandy card turned out so cute - that image is adorable! Thank you for doing these! Couldn't find the video on YouTube. I appreciate all that I've learned from watching the different episodes. Oh, I can see the Stump Sandy card much better than I could on my computer monitor! This is SO cute and I love the touch of brown ribbon! Great show, Sandy. I watched the live show for the first time last night. Loved Stump Sandy, of course, and thought the idea given by someone in chat to use a shoelace instead of ribbon was brilliant to go with the stamped image. I guess I'll add one to my ribbon stash, as you never know when you might need one! Laura's "do over" card is just my style. 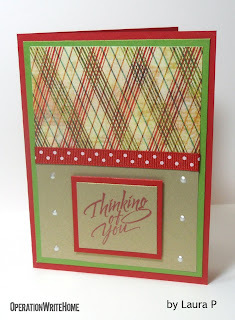 Love the angled plaid she used. Your insights on design are always great and it's amazing what you do on the fly. Thanks for another great episode. That's a really cute haircut Sandy and I like what you did with the ribbon. I have a lot of spools on the wider side that I don't tie bows with; now I have another way to use them! Thanks!